Images of stimulated Raman scattering (SRS) microscopy coupled with alkyne tags for visualizing a broad spectrum of small molecule dynamics in live cells and animals, including metabolic incorporation of small molecule precursors of nucleic acids for de novo synthesis of DNA (magenta image) and RNA (cyan image), amino acids for newly synthesized proteins (red image), lipids for choline phospholipids (yellow image) and triglycerides (blue image); and delivery pathways of small molecule drugs in mouse ear tissues (green image). Credit: Lu Wei of Columbia University. Researchers at Columbia University have made a significant step toward visualizing small biomolecules inside living biological systems with minimum disturbance, a longstanding goal in the scientific community. In a study published March 2nd in Nature Methods, Assistant Professor of Chemistry Wei Min's research team has developed a general method to image a broad spectrum of small biomolecules, such as small molecular drugs and nucleic acids, amino acids, lipids for determining where they are localized and how they function inside cells. When studying biological functions of a molecule in complex and mysterious cells, researchers typically label the molecules of interest with fluorophores, a kind of molecules that glow when illuminated. Using a fluorescence microscope, common in research labs, the fluorophore-tagged molecules can be located and tracked with high precision. The invention of green fluorescent protein (GFP), in 1994, compatible with imaging inside live cells and animals, has since made fluorescence microscopy even more popular. However, when it comes to small biomolecules, fluorophore tagging is problematic, because the fluorophores are almost always larger or comparable in size to the small molecules of interest. As a result, they often disturb the normal functions of these small molecules with crucial biological roles. To address this problem, Min and his team departed from the conventional paradigm of fluorescence imaging of fluorophores, and pursued a novel combination of physics and chemistry. Specifically, they coupled an emerging laser-based technique called stimulated Raman scattering (SRS) microscopy with a small but highly vibrant alkyne tag (that is, C=C, carbon-carbon triple bond), a chemical bond that, when it stretches, produces a strong Raman scattering signal at a unique "frequency" (different from natural molecules inside cells). This new technique, labeling the small molecules with this tiny alkyne tag, avoids perturbation that occurs with large fluorescent tags, while obtaining high detection specificity and sensitivity by SRS imaging. By tuning the laser colors to the alkyne frequency and quickly scanning the focused laser beam across the sample, point-by-point, SRS microscopy can pick up the unique stretching motion of the C=C bond carried by the small molecules and produce a three-dimensional map of the molecules inside living cells and animals. In this way, Min's team demonstrated tracking alkyne-bearing drugs in mouse tissues and visualizing de novo synthesis of DNA, RNA, proteins, phospholipids and triglycerides through metabolic incorporation of alkyne-tagged small precursors in living cells (see Figure). "The major advantages of our technique lie in the superb sensitivity, specificity and biocompatibility with dynamics of live cells and animals for small molecule imaging," says the lead author Lu Wei, a Ph.D. candidate in chemistry. Next, Min's team will apply this new technique to biomedical questions, such as detecting tumor cells and probing drug pharmacokinetics in animal models. 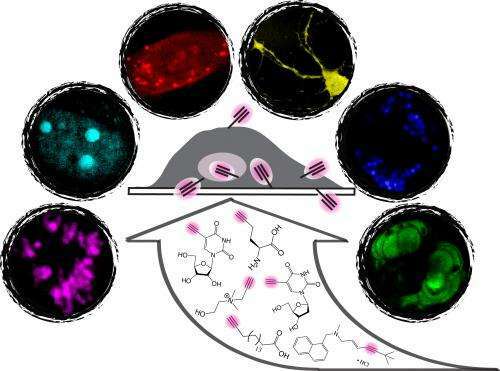 They are also creating other alkyne-labeled biologically active molecules for more versatile imaging applications. "Our new technique will open up numerous otherwise difficult studies on small biomolecules in live cells and animals", says Min. "In addition to basic research, our technique could also contribute greatly to translational applications. I believe SRS imaging of alkyne tags could do for small biomolecules what fluorescence imaging of fluorophores such as GFP has done for larger species."